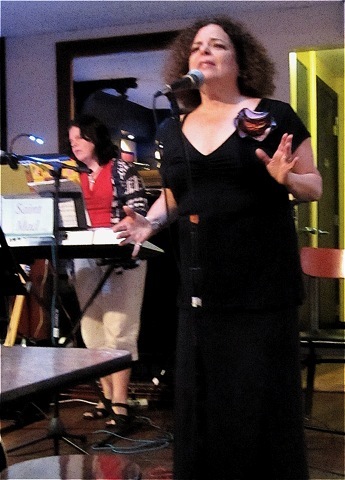 Claudia Beechman and Tom Baust present "Soiree Parisienne"
Kennedy House 1901 J.F.K. Blvd. Philadelphia, PA.
Wednesday, April 22 2009 at 7:45 P.M. Featured performer in the opening of the University of the Arts Laurie Beechman Cabaret Theatre, "Soiree Parisienne"
The Laurie Beechman Cabaret Theatre at The Arts Bank, Avenue of the Arts and Pine Streets, Philadelphia, PA. The newly renovated intimate cabaret space is named in memory of Claudia's sister Laurie Beechman, a singer and actress who appeared in several major Broadway shows. Laurie received Tony Award and Drama Desk Award nominations for her performance in ”Joseph and the Technicolor Dreamcoat” in 1982; she also appeared as Grizabella in “Cats” and Fantine in “Les Miserables” on Broadway, and had the honor of singing at President Bill Clinton’s 1997 Inauguration. The evening will also feature the winner of the Laurie Beechman Memorial Scholarship, which given annually to a distinguished senior in the Musical Theater Program at The University of the Arts. Other nominees will also perform. The Laurie Beechman Memorial Scholarship was established in 1999 by Laurie’s mother, Dolly Beechman Schnall, and her husband, Dr. Nathan Schnall, along with Laurie’s sisters Claudia and Jane and their families and friends. 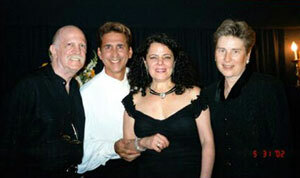 Claudia is featured on the website for New Mystics. Claudia's poem "The Armoire" has recently been set to music by a local pianist and composer, Rich Rudin. 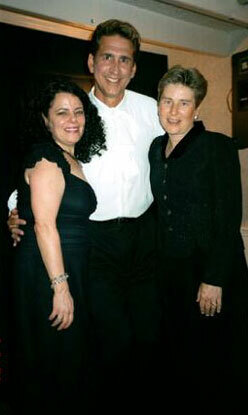 Claudia recently wrote an essay that appeared in the Philadelphia Inquirer Metro Commentary on June 25, 2003. Congrats to Claudia for having her first poem published in Bucks County Writer Magazine this past January! Claudia's second solo CD, "The Grand Legrand", is now available! This CD features the work of noted French composer Michel Legrand. Click here for information on ordering the CD for yourself! 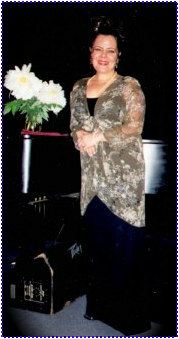 Congrats to Claudia for being the only American selected to perform in France at Le Festival Visa Francophone in July 2001! Although notification came too late for her to participate this year, she plans to participate next year in this international music festival which promotes various kinds of French music. An article about Claudia was featured in the Philadelphia Inquirer Neighbors section on June 24, 1999. 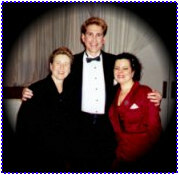 In early 1999, Claudia's CD got a rave review in Tony Swanick's Washington D.C. column on the Talkin Broadway website. 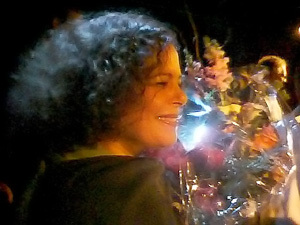 Claudia's solo CD, Souvenirs de Paris, was released in early January 1999. If you would like a copy, please go to the order form. Claudia chats with Olympia Dukakis after Claudia's performance at the A-T Children's Fund Benefit at the Clarke Theatre, Lincoln Center, NYC, on January 10, 2000. 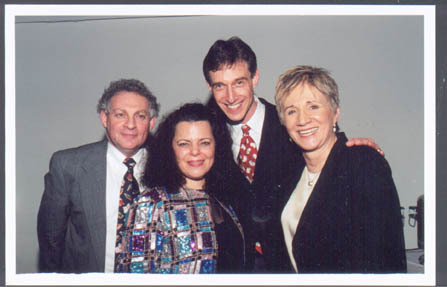 From left to right: Barry Cohen, Claudia, Eric Weinberger, benefit chairman, and Olympia Dukakis, benefit emcee.